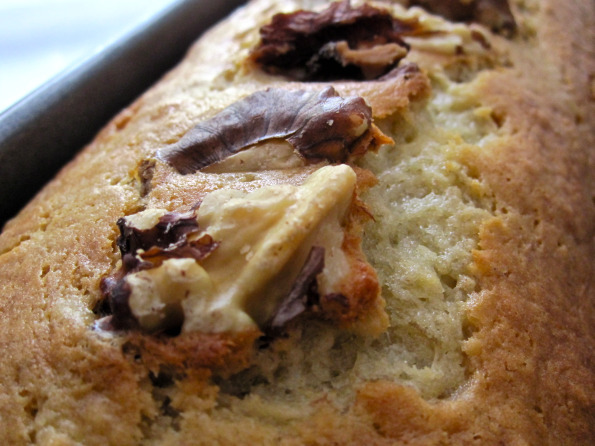 Here is the thing about banana bread: as each recipe gets passed along someone adds a banana. And if they didn’t add a banana, they added more vanilla. Eventually there will be a banana bread recipe that is nothing but bananas and vanilla. I have never been offered a slice of homemade banana bread without the whisper of the baker’s banana bread secret, “The recipe called for 3 bananas, but I added 4.” Always said with a gleam in their eye. These banana bread baking rebels are everywhere. And yes, *of course* I added an additional banana. It’s banana bread baking tradition! I’m not about to mess with it. But more than just the ease of delivery, it’s this deal that’s responsible. Barring a pet monkey, a mere mortal can’t possibly expect to eat their way though the cubic yard of bananas this value pack gets you. So what’s a girl to do? Bake banana bread! What else is a girl to do? Give away loaf after loaf of it to her friends! Suddenly, I’m very popular. This has been my go-to banana bread recipe for some time, mainly because I’m a sucker for sour cream in baked goods. This bread is dense, moist (seriously, what is a good synonym for moist?) and banana-ful. I urge you to give it a go. And I further urge you, no dare you, to add another banana. Combine sugar and butter in a bowl; beat at medium speed of a mixer until pale yellow and fluffy. Add mashed banana, milk, sour cream, and egg; beat well. Combine flour, baking soda, and salt in a separate bowl; whisk to blend. Add dry ingredients to creamed mixture – 1/2 then beat until combined, then the last half, beat until combined. Spoon batter into loaf pan coated with cooking spray. Bake at 350° for 55-65 minutes or until a wooden pick inserted in center comes out clean. 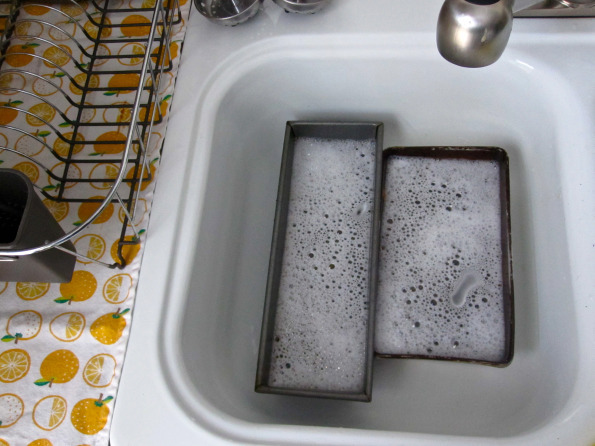 Let cool in pan for 10 minutes; remove from pan. Let cool completely. This entry was written by haikugirl, posted on September 6, 2010 at 10:59 am, filed under Baking, Bread, Breakfast, Sweets. Bookmark the permalink. Follow any comments here with the RSS feed for this post. Post a comment or leave a trackback: Trackback URL. Firstly, I want to say thank you for stopping by Foodie House! Secondly, I’m cracking up because I am currently working on a post for banana bread…turned cupcakes. I’m also laughing because I’m a sucker for sour cream baked goods as well. AND I totally get the “extra” stuff. My mom is a classic “extra” person. She does it to nearly every recipe. Sometimes it works, sometimes it doesn’t. But I agree, with banana bread, you cannot go wrong! I love your blog, great pictures and such a calming layout. Easy to read and inviting. Nice to meet you! Hi Lauren! I enjoyed your SBUX story. I have worked many a coffee shop job but never with such a co-worker. I’m glad she kinda came around. But if that iced mocha is as good as it looks — totally worth it. Thank you for stopping by! And the nice compliments! 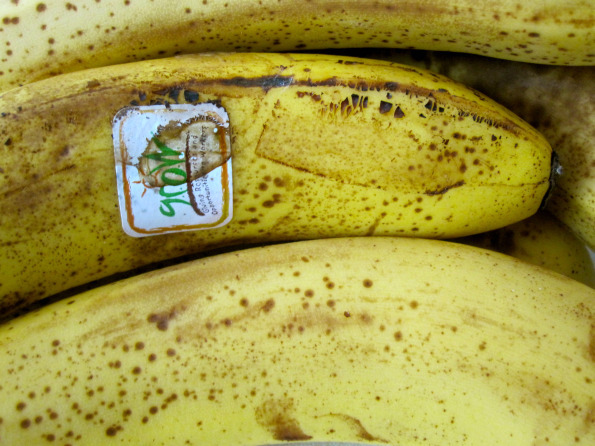 Here’s to an unlimited supply of old bananas! Mmm, the sour cream. Genius! Isn’t it though? Love sour cream in sweet things. Kinda hate it everywhere else. Inspired by you I just put a batch of this in the oven plus pecans. Can’t wait to try it! Oh yay! Pecans will be delish. Does your house smell good yet? 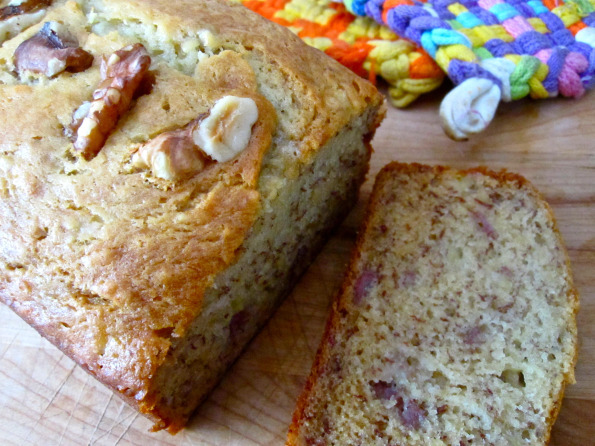 This cracked me up, “This whisper of the baker’s banana bread secret…” so true! For the record, I LOVE baked goods with either buttermilk, yogurt or sour cream in them: so moist! It’s my favorite thing. Followed by the “I added more chocolate chips” chocolate chip cookie baker. Hee hee. When do I put in the vanilla ? Hi Kyle — you can add it with the bananas! I hope it turned out and you lurved it! Hi! I only have normal cream (not sour), can I add this?